Junko provided a demonstration as a part of Jame's Roper's first solo exhibition, Metanoia. Junko provided a demonstration followed by a successful introductory workshop over the course of this two day festival in Manchester's city centre. 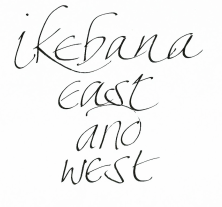 ​A four hour in-depth workshop for students new to Ikebana, hosted at HOME - Manchester's prime cultural centre. After the huge success of the event held in April, Junko gave a second workshop at Manchester's all time favourite cultural centre. Manifest Arts Festival and Junko joined forces, and this Ikebana workshop was a big success at this year's festival! More than 30 students who are studying Japanese history have attendant to listen Junko's talk about Japanese ancient culture and Ikebana in modern world. 5 hours workshop was a successful event. Ten attendants all enjoyed the Ikebana experience with Junko. Please see the gallery page for images from the workshop. This summertime workshop at the Old Parsonage was a big success! Please see the gallery page for images from the workshop. Following the success of her first workshop, Junko returned to the Chorlton Nursery for the village's Art Festival. 2-hour lovely workshop in the heart of Chorlton with Nimira, owner of the Nursery. Please see the gallery page for images from the workshop.